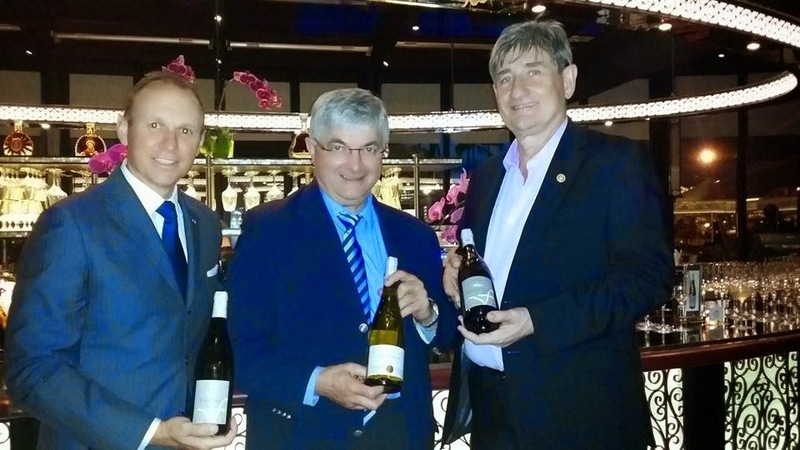 Sofitel Hotel, Loire Valley Wine and Le Cellier recently hosted the Loire Valley Wine Dinner and was attended by winemaker, Monsieur Claude Fournier of Fournier Pere et Fils from the Loire Valley in France. The Wine Dinner aims to pair 10 bottles of Fournier Pere et Fils Wine from the endless buffet spread of Spiral Restaurant of Sofitel Hotel. Loire Valley, (pronounced as lwa) aside from being a wine region is also known for its chateaus and fruit orchards. In 2000, UNESCO included a part of Loire Valley to its list of UNESCO World Heritage Site. Guests from the French community in Manila as well as some from the media enjoyed the evening sipping wine. Monsieur Claude Fournier introducing Fournier Pere et Fils wine during the special dinner with Monsieur Bernard Flour of Le Cellier. Here's a list of wine pairing choices although you can be adventurous and just trust your instincts and palate with wine and food. I particularly liked the Pouilly Fume Blanc AOC 2011 Les Deux Cailloux- Fournier Pere et Fils with cheese and lobster. So good! Then I had the Anjou Rouge AOC 2010 'Clos du Saut au Loup' Domaine Dozon with foie gras. Actually, the waiting staff at La Veranda were very helpful with the wine choices when they see the food on our plates. They're also quick to suggest which wine goes well with this particular food.